The Battle of the Sheaves as related by Rev J.G. Campbell, minister of Tiree 1861-1891, was said to have been fought between Loch Bhasapol and Cornaigmore beach. "Well armed and fierce Vikings came suddenly upon natives as they were busily engaged in harvesting their corn". The custom was to pluck the corn not harvest with either sickle or knife. The Tiree men faced the Vikings with nothing but sheaves of corn, "Fierce and strong the battle waged ". The better armed vikings were blinded by the flying, pelting grain and ran off leaving the bodies of their fallen comrades behind; only a few escaped to their boats. The Tiree mens prowess was described "Sguab choirce gu crios ann an crios Lochlannaich", "A corn sheaf to it's band in a Norseman's stomach". 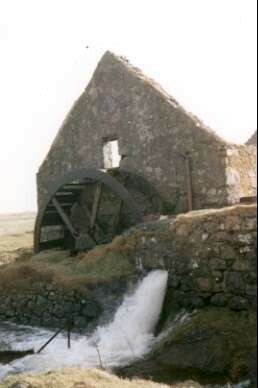 The mill near Loch Bhasapol was built to supply the needs of the whole of Tiree and was equipped with all the latest technology at the end of the last century, now, it stands disused and derelict but the mill wheel is still visible and the sluice from the loch is still, in the main, intact. The two townships are steeped in lore and many stories abound and in history they appear to have an important standing on the Island. 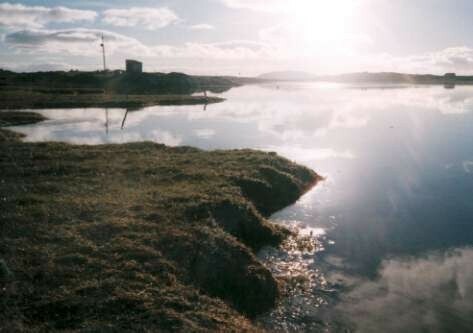 This too, is reflected today, as Cornaig is the centre for learning, the site of both the Primary and Secondary schools to which pupils from every corner of the Island are transported. The Cornaig Higher Grade School was opened in 1876 under the Education Act of 1872 and was replaced by a modern up to date school in 1936. Advanced pupils from all over the Island were taken to this new school. The Primary part of the Cornaig school opened in ...... and sounded the death knell for all the one room schools dotted over the Island and founded the system we have today. Children from 5 to 18 are catered for in a school which would be the envy of many a community.